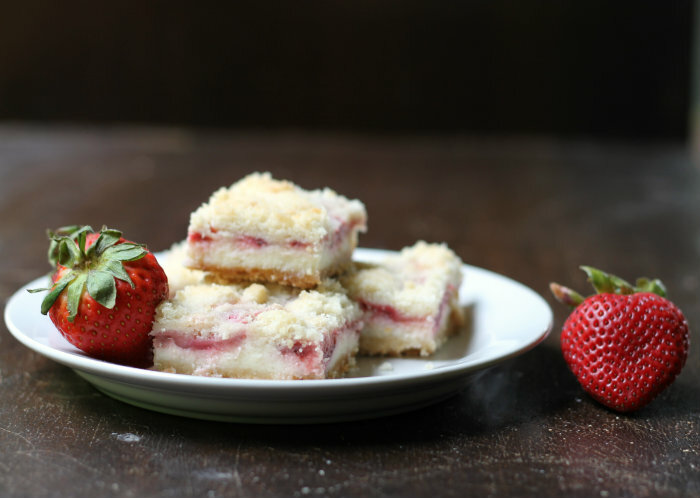 You won’t be able to resist these strawberry cheesecake crumb bars… between the sweet crumbly crust and strawberry cheesecake mixture they are truly irresistible. It is just about strawberry season in my neck of the woods. But for the time being I am stuck buying my strawberries in the grocery store. Although I prefer to pick fresh strawberries, right now the berries that I am seeing in the stores are not too bad. As I had mentioned a couple of posts ago, there is always a large gathering at my mom’s house for Memorial Day. Most of my family comes to celebrate the day and the family members that have gone before us. There is always a ton of food. It is the beginning of the grilling season and grilled turkey and brats are always on the menu. As far as the sweets go, there is a small card table set up just to hold all of the bars that everyone brings. Normally I would bring chocolate… being the chocolate lover that I am. 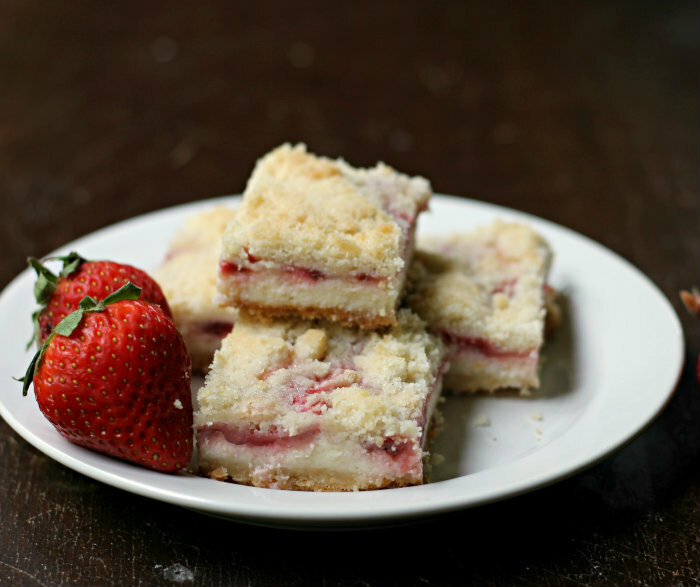 But this year I made these strawberry cheesecake crumb bars, I was not to sure how they would go over with everyone. Yeah, I am not the only chocolate lover in my family and it seems like the chocolate bars are always the first ones to go. Well let me tell you when I brought my pan home in the evening all that was left were two little bars. It was a good thing that I took pictures before I left in the morning. I have to say I am shocked that they went over that well, but then I am not shocked. 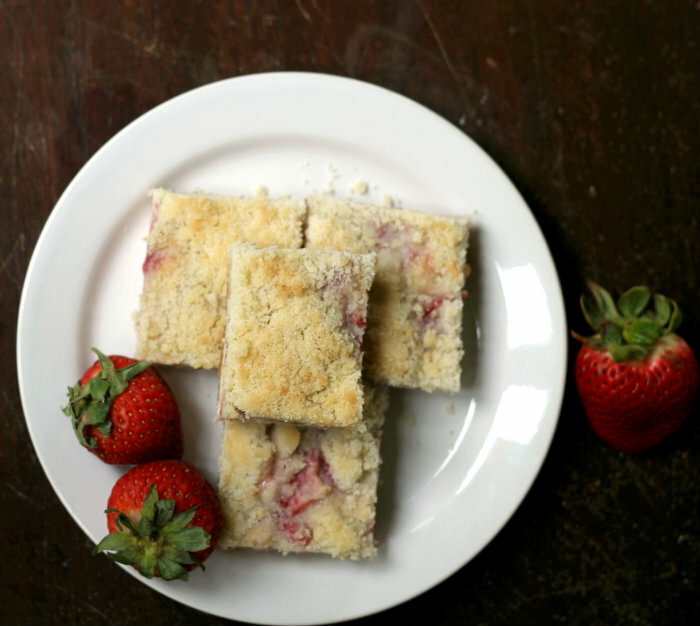 Because when you put together strawberry, cream cheese, and a sweet crumbly crust, I mean really who can resist. I guess an almost empty pan tells the whole story… they are yummy. Crumbly crust- Preheat oven to 375 degree F. Lightly grease a 9 by 13 inch baking pan and set aside. In a large mixing bowl add the flour, sugar, baking powder and mix until blended. Add the pieces of butter to the mixture, with pastry cutter or by hand work in the butter (I prefer doing this by hand). You will want end up with a mixture of crumbs the size of peas. 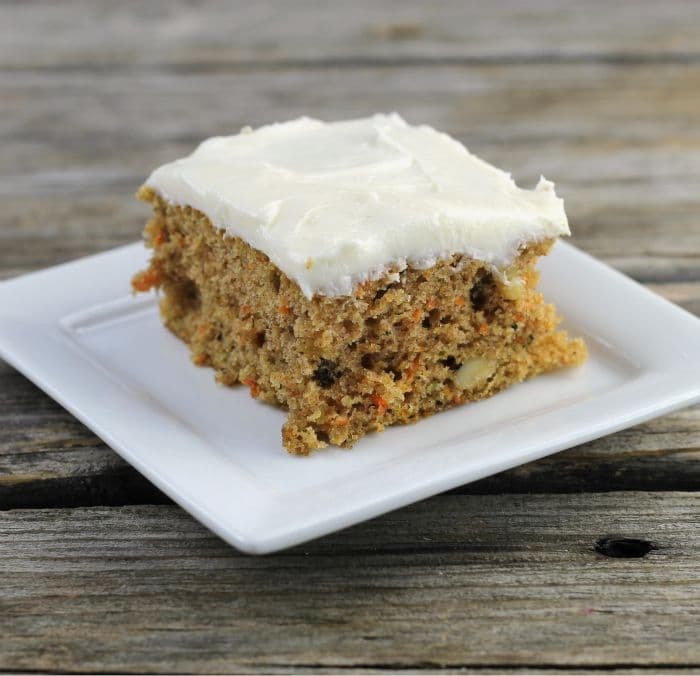 Take one-half of the crumbs and press into the prepared baking pan. Place in the preheated oven for 10 to 12 minutes or until lightly browned. Place the remaining crumbs in the refrigerator to keep cold. Cream cheese filling- While the bottom crust is baking add the cream cheese and sour cream to a medium bowl and beat with an electric mixer until fluffy. Add the egg and mix until blended. Add the sugar and almond extract and mix until incorporated. 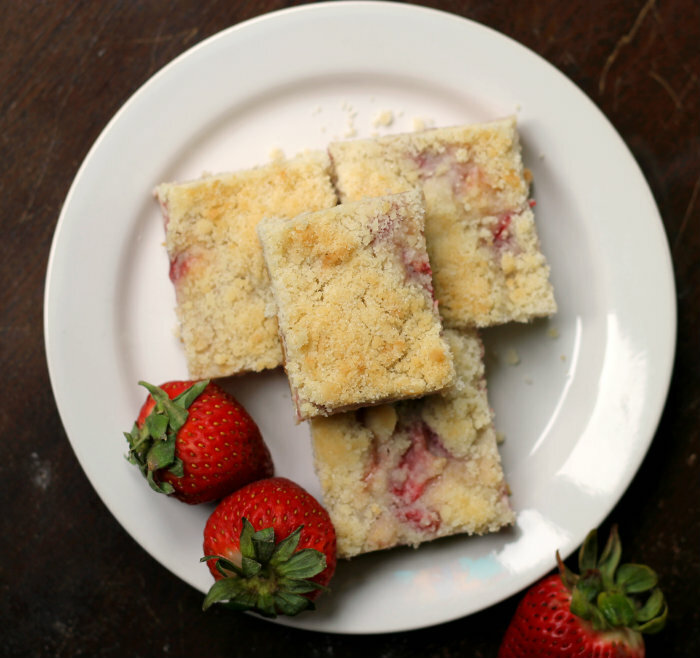 Strawberries filling - While the bars are baking in a medium bowl toss the sliced strawberries with the sugar, cornstarch and lemon juice. Assembling - Once the bottom crust is baked remove from the oven. Spread the cream cheese mixture evenly over the top of the crust. Take the strawberries and sprinkle evenly over the top of the filling. Take the rest of crust mixture and crumble evenly over the berries. Place bake in the oven and bake 35 to 40 minutes until lightly browned. 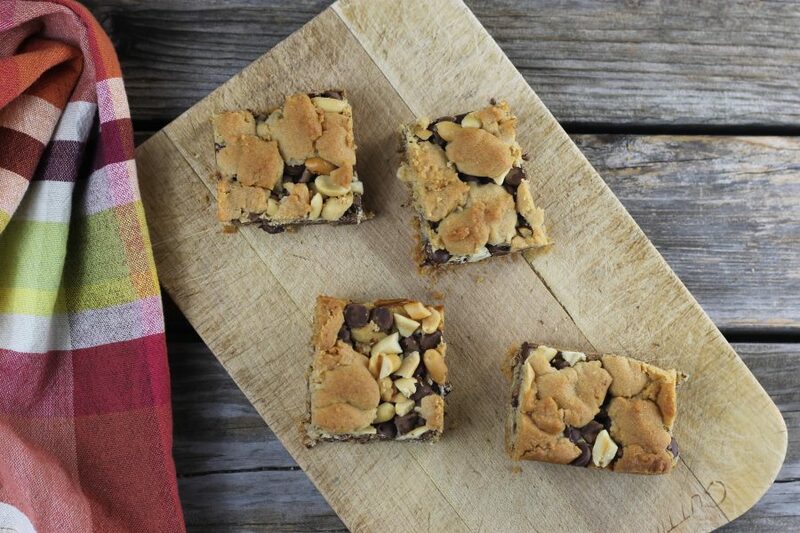 Remove from oven and cool before cutting into bars.